for pools of different shapes, sizes, flow rates and debris types. 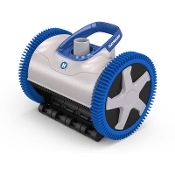 even at lower flow and provides the peace of mind of clog-free cleaning – covering pool floor, walls* and coves. Note: If you have diving pool or very large Pool you need the 4 wheel model. If you have a play pool you need the 2 wheel model.